Önemli bir meyve zararlısı olan Akdeniz meyve sineği, Ceratitis capitata (Wiedemann, 1824) (Diptera, Tephritidae)’nın yayılış alanını mevcut iklimsel koşullar altında genişletmeyeceği düşünülmekte; ancak, C. capitata istilası için uygun görünen Karadeniz kıyılarının bu genellemenin dışında olduğu varsayılmaktadır. Batı Karadeniz Bölgesi’nde C. capitata ile enfekte olmuş bir mandalina bulunduktan sonra bu varsayım sınanmıştır. Öncelikle Türkiye’de C. capitata’nın yaşamasına uygun olan alanların tespiti için ekolojik niş modellemesi yaklaşımı kullanılmış, daha sonra da modelin uygun olarak tahmin ettiği Doğu Karadeniz Bölgesi’nde arazi çalışmaları yapılmıştır. Modelleme için C. capitata’nın varlığı bilinen Akdeniz ve Ege Bölgesi’nden 49 noktadan ve C. capitata’nın varlığı bilinmeyen Karadeniz Bölgesi’nden bir noktadan 2014 ve 2015 yılları Kasım ayında meyve örneği toplanmış ve laboratuvara getirilerek ergin çıkışları izlenmiştir. Toplamda 44 farklı yöreden ergin C. capitata elde edilmiştir. Bu noktalar model için veri olarak kullanılmıştır. Modelleme sonuçlarına göre Karadeniz Bölgesi’nde arazi çalışmaları gerçekleştirilmiştir. Meyve örnekleri 11 noktadan toplanarak laboratuvara getirilmiş ve ergin çıkışları izlenmiştir. Bu örneklerden toplam 49 ergin C. capitata çıkmıştır. Böylece Doğu Karadeniz’de Akdeniz meyve sineğinin ilk kez varlığı gösterilmiştir. Model ayrıca gelecekte Karadeniz havzasında C. capitata için uygun olan alanların oluşacağını da göstermektedir. Mediterranean fruit fly, Ceratitis capitata (Wiedemann, 1824) (Diptera, Tephritidae), an important fruit pest, is not expected to expand its range under current climatic conditions with an exception of the Black Sea coasts that was hypothesized to be suitable for C. capitata invasion. After finding a C. capitata-infested mandarin in western Black Sea Region of Turkey, we tested this hypothesis. We first used ecological niche modeling approach to determine suitable places for C. capitata survival in Turkey; and then visited eastern Black Sea region of Turkey where the model predicted to be suitable. 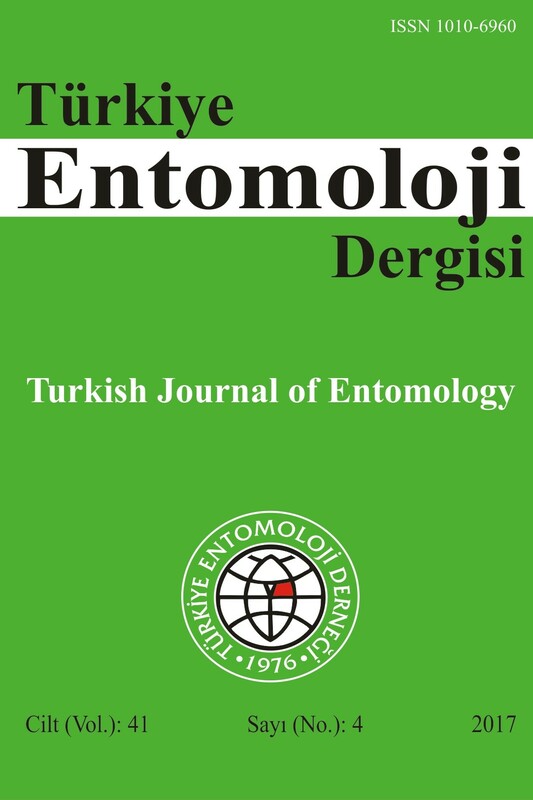 For the model, we collected fruit samples from 49 localities in southern and western Turkey, where C. capitata presence has already been known, and one locality from northern Turkey, where its presence has not been known, in November 2014 and 2015 and transferred them to laboratory to observe adult emergence. Ceratitis capitata adults emerged from 44 localities. These localities were used as the presence data for the model. After obtaining the model results, we visited eastern Black Sea Region, and collected fruit samples from 11 different localities, and transferred them to laboratory to observe adult emergence. In total, 49 C. capitata adults emerged. Thus, presence of C. capitata was shown in the eastern Black Sea for the first time. The model also predicted that suitable areas in the Black Sea basin for C. capitata survival tend to expand in future. Bayrak, N. & R. Hayat, 2012. Türkiye’nin Tephritidae (Diptera) türleri. Türk Bilimsel Derlemeler Dergisi, 5 (2): 49-55. Bergsten, D., D. Lance & M. Stefan, 1999. Mediterranean fruit flies and their management in the USA. The Royal Society of Chemistry, 10: 207-212. BKU (T.C. Gıda Tarım ve Hayvancılık Bakanlığı, Bitki Koruma Ürünleri Daire Başkanlığı), 2016. Akdeniz meyve sineği (Ceratitis capitata). (Web page: https://bku.tarim.gov.tr/Zararli/Details/1059) (Date accessed: February 2016). Brown, J. L., 2014. SDMtoolbox: a python‐based GIS toolkit for landscape genetic, biogeographic and species distribution model analyses. Methods in Ecology and Evolution, 5 (7): 694-700. Elekçioğlu, N. Z., 2009. Akdeniz Meyvesineği. Biyoloji Bilimleri Araştırma Dergisi, 2 (1): 61-65. Elekçioğlu, N. Z., 2013. Fruit flies of economic importance in Turkey, with special reference to Mediterranean fruit fly, Ceratitis capitata (Wied.). Türk Bilimsel Derlemeler Dergisi, 6 (2): 33-37. Elith, J., M. Kearney & S. J. Phillips, 2010. The art of modelling range-shifting species. Methods in Ecology and Evolution, 1: 330-342. EPPO (European Plant Protection Organization), 1981. Data sheets on quarantine organisms, No. 105, Ceratitis capitata. Bulletin OEPP/EPPO Bulletin, 11 (1): 1-7. EPPO (European Plant Protection Organization), 2015. EPPO A2 list of pests recommended for regulation as quarantine pests. (Web page: http://www.eppo.int/QUARANTINE/listA2.htm) (Date accessed: February 2016). Fielding, A. H. & J. F. Bell, 1997. A review of methods for the assessment of prediction errors in conservation presence/absence models. Environmental Conservation, 24: 38-49. Fourcade, Y., J. O. Engler, D. Rodder & J. Secondi, 2014. Mapping species distributions with MaxEnt using a geographically biased sample of presence data: a performance assessment of methods for correcting sampling bias. PLoS ONE, 9 (5): e97122. Gassó, N., W. Thuiller, J. Pino & M. Vilà, 2012. Potential distribution range of invasive plant species in Spain. NeoBiota, 12: 25-40. Guisan, A. & W. Thuiller, 2005. Predicting species distribution: offering more than simple habitat models. Ecology Letters, 8: 993-1009. Gür, H., 2013. The effects of the Late Quaternary glacial–interglacial cycles on Anatolian ground squirrels: range expansion during the glacial periods? Biological Journal of the Linnean Society, 109: 19-32. Harris, E. J. & G. Olalquiaga, 1991. Occurrence and distribution patterns of the Mediterranean fruit fly in desert areas in Chile and Peru. Environmental Entomology, 20: 174-178. Hendrichs, J., G. Franz & P. Rendon, 1995. Increased effectiveness and applicability of the sterile insect technique through male-only releases for control of Mediterranean fruit flies during fruiting seasons. Journal of Applied Entomology, 119: 371-377. Hijmans, R. J. & C. H. Graham, 2006. The ability of climate envelope models to predict the effect of climate change on species distributions. Global Change Biology, 12: 2272-2281. Hijmans, R. J., S. E. Cameron, J. L. Parra, P. G. Jones & A. Jarvis, 2005. Very high resolution interpolated climate surfaces for global land areas. International Journal of Climatology, 25: 1965-1978. Israely, N., Y. Ziv & R. Calun, 2005. Metapopulation spatial-temporal distribution patterns of Mediterranean fruit fly (Diptera: Tephritidae) in a patchy environment. Annals of the Entomological Society of America – BioOne, 98 (3): 302-308. Liquido, N. J., R. T. Cunningham & S. Nakagawa, 1990. Host plants of Mediterranean fruit fly (Diptera: Tephritidae) on the Island of Hawaii (1949-1985 survey). Journal of Economic Entomology, 83: 1863-1878. Meats, A. & C. J. Smallridge, 2007. Short- and long-range dispersal of medfly, Ceratitis capitata (Dipt., Tephritidae), and its invasive potential. Journal of Applied Entomology, 131 (8): 518-523. Moss, R. H., M. Babiker, S. Brinkman, E. Calvo, T. Carter, J. A. Edmonds & M. Zurek, 2008. Towards New Scenarios for Analysis of Emissions, Climate Change, Impacts, and Response Strategies. United States, IPCC Expert Meeting Report. Intergovernmental Panel on Climate Change, Geneva, Switzerland, 34 pp. Nogués-Bravo, D., 2009. Predicting the past distribution of species climatic niches. Global Ecology and Biogeography, 18: 521-531. O’Connor, M. I., B. Gilbert & C. J. Brown, 2011. Theoretical predictions for how temperature affects the dynamics of interacting herbivores and plants. The American Naturalist, 178: 626-638. Pedigo, L. P. & M. E. Rice, 2009. Entomology and Pest Management. Macmillan Publishing Company, 784 pp. Peterson, A. T., M. A. Ortega-Huerta, J. Bartley, V. SánchezCordero, J. Soberón, R. H. Buddemeier & D. R. B. Stockwell, 2002. Future projections for Mexican faunas under global climate change scenarios. Nature, 416: 626-629. Phillips, S. J., R. P. Anderson & R. E. Schapire, 2006. Maximum entropy modeling of species geographic distributions. Ecological Modelling, 190: 231-259. Sen, S., K. N. Shivaprakash, N. A. Aravind, G. Ravikanth & S. Dayanandan, 2016. Ecological niche modeling for conservation planning of an endemic snail in the verge of becoming a pest in cardamom plantations in the Western Ghats biodiversity hotspot. Ecology and Evolution, 6 (18): 6510-6523. Shoukry, A. & M. Hafez, 1979. Studies on the biology of the Mediterranean fruit fly Ceratitis capitata. Entomologia Experimentalis et Applicata, 261: 33-39. Tanarhte, M., P. Hadjinicolaou & J. Lelieveld, 2012. Intercomparison of temperature and precipitation data sets based on observations in the Mediterranean and the Middle East. Journal of Geophysical Research, 117: D12102. Taylor, F., 1981. Ecology and evolution of physiological time in insects. American Naturalist, 117: 1-23. TUİK (Türkiye İstatistik Kurumu), 2016. Bitkisel Üretim İstatistikleri, (Web page: http://www.tuik.gov.tr/PreTablo.do?alt_id=1001) (Date accessed: February 2016). UF-IFAS (University of Florida, Institute of Food and Agricultural Sciences), 2016. Mediterranean fruit fly. (Web page: http://entnemdept.ifas.ufl.edu/creatures/fruit/mediterranean_fruit_fly.htm (Date accessed: February 2016). USDA (U.S. Department of Agriculture, Animal and Plant Health Inspection Service), 2003. Mediterranean fruit fly action plan. Plant Protection and Quarantine, Version 12/2003-02. Waltari, E. & R. P. Guralnick, 2009. Ecological niche modelling of montane mammals in the Great Basin, North America: examining past and present connectivity of species across basins and ranges. Journal of Biogeography, 36: 148-161. Waltari, E., S. Perkins, R. Hijmans, A. T. Peterson, Á. Nyári & R. P. Guralnick, 2007. Locating Pleistocene refugia: Comparing phylogeographic and ecological niche model predictions. PLoS ONE, 2 (7): e563.